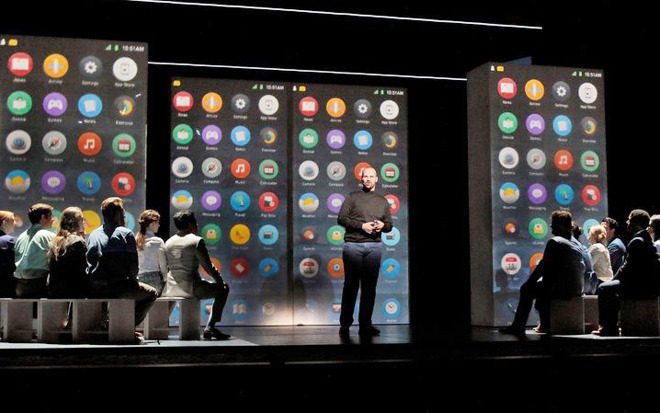 "Steve Jobs" was composed by Mason Bates, and recorded by the Sante Fe Opera Orchestra. It takes place within a single act but jumps around in time, depicting milestones like the founding of Apple and the launch of the iPhone, mixed in with personal events and Jobs' interest in Zen Buddhism. Some of the opera's competition included a recording of Richard Strauss' "Der Rosenkavalier" starring Renee Fleming, and a BBC production of John Adams' "Doctor Atomic," about the testing of the first nuclear warhead in 1945. Apple hasn't called any attention to the win, presumably because it wasn't directly involved and the opera is sometimes critical. The company has been careful about shaping public opinion of its co-founder — while it's quick to praise his intellect, it has sidestepped issues like child custody fights and questionable business decisions. The company has been using the Grammys to call attention to Apple Music, for instance pointing out the success of Ariana Grande's "Thank U, Next," and running memoji-themed billboards and TV ads.